AD7705 and AD7706 are two 16-bit Sigma Delta ADCs. Equipped with on-chip digital filters and programmable gain front ends, these chips are ideal for low frequency multi-channel signal measurements. The main difference between AD7705 and AD7706 is that AD7705 has two fully differential input channels while AD7706 has three pseudo differential input channels. This library I created interfaces with Arduino using the standard SPI bus. Most of the complexity is hidden behind the scene, and only a single parameter — the reference voltage — is needed to initialize the library since the reference voltage can vary depending on the particular implementation. The following code snippet illustrates how to use this library. In this example, channel 1 of AD7706 is setup in bipolar mode with a unity gain. The common pin of the pseudo differential inputs (AIN1 to AIN3) is tied to the 2.5V voltage reference. This gives a measurement range of -2.5 V to +2.5 V. Pin SCK, CS, MOSI, MISO correspond to Arduino pin 13, 10, 11 and 12 respectively. For a supply voltage of 5V, the recommended voltage reference is AD780/REF192. I used two 1.25 V precision shunt voltage references ADR1581 to form a 2.5V reference instead since those are the components I have on hand. For more details, please refer to the datasheet and the code in the download section. I’ve just tested your library and it works great. You’ve done a pretty good job! although, I’ve got a question: How can I read all the analog input channels? Thanks pfg. You can just initialize both AD770X::CHN_AIN1 and AD770X::CHN_AIN2 and use them in your code. Thanks Kerry for the quick reply. I get only one value, the same for the three reading and it’s also wrong. I wired up a AD7706 and used a AD680 as a voltage reference, exactly as in your example (Vcc I drew from 5V in Arduino). I got the example to compile and upload alright, but when I opened up the serial monitor, it was blank and nothing shows up. Hmm… I guess I’ll need more detailed description in order to understand why nothing shows up on serial monitor. Question, if you do a Serial.print in the same program does anything come out? 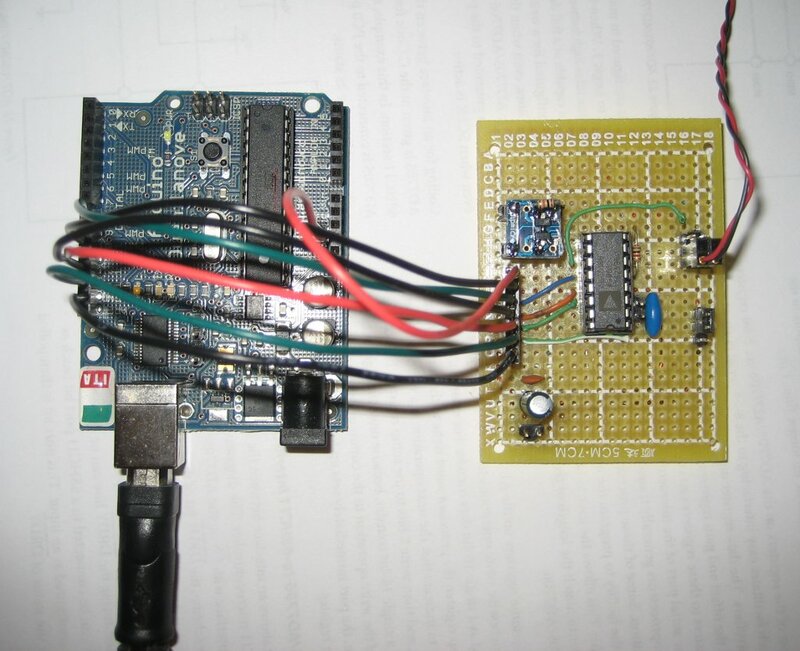 Yes, with the same circuit, if I run one of the sample code from Arduino like “AnalogReadSerial” here: http://arduino.cc/en/Tutorial/AnalogReadSerial, it will print out numbers. in the setup, as well as this line in the loop “v = ad7706.readADResult(AD770X::CHN_AIN1)”, in a sense that if I asks it to just print something, like “1”, I need to comment both lines (like below), and if either line is active, the code will not reach to the print line. OK. Check your MISO/MOSI pin connections and make sure that they are not reversed. The symptom you described sounds like issue with the SPI bus. The MOSI and MISO are connected to Arduino digital pin 12 and 11, correct (chip pin 17 and 18). These two pins are reserved for SPI operations. I checked my circuit, and MISO and MOSI were indeed reversed. I’ve corrected it as you said (although I think you meant the chip pins 13 and 14, not 17 and 18), so now MISO (chip pin 13) is hooked to Arduino pin 11, and MOSI (chip pin 14) is hooked to Arduino pin 12, but still nothing shows up on the serial monitor… The problem encountered as described in my last post still persists. On another note, I’m using Arduino Mega 2560, maybe that’s the case? 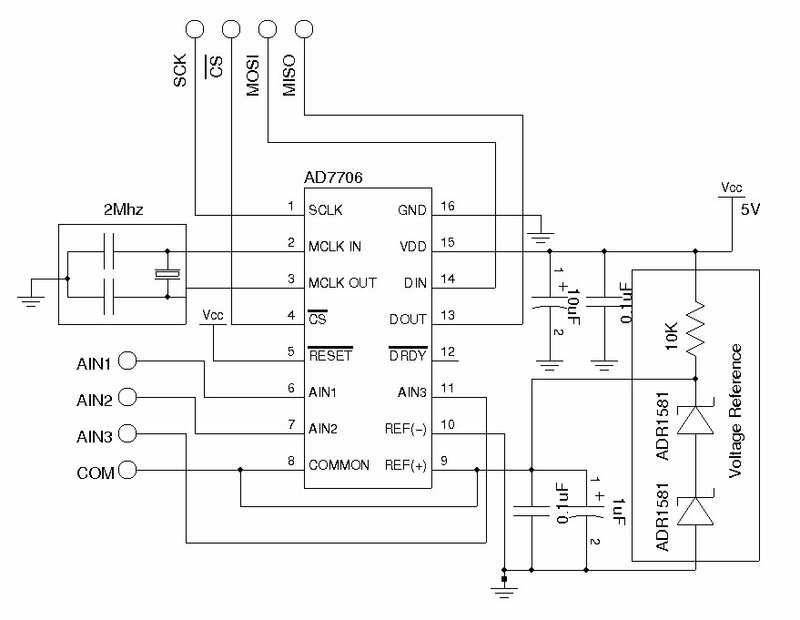 I don’t have ATmega 2560, but from the schematics (http://arduino.cc/en/uploads/Main/arduino-mega2560-schematic.pdf) it seems that the MOSI/MISO are 50/51. The code should work with all Arduino boards. Good luck! I’ll get “2.50” or “-2.50” printed one or the other, and which one to be printed is rather arbitrary, although neg seems to be preferred. Same if I type in arbitrary number (like 330) in the reference voltage variable, so the ADC seems to not be converting at all, and the readADResult(byte channel) function doesn’t seem to be working, in a sense that if I let it return “0” or “2*VRef”, it will still return VRef. All channels (1, 2, 3, COMM) will give me 1.00 volt, and if I set the Vref to be CHN_AIN1, I will get 0.00V on all channels; CHN_AIN3 for 3V, and CHN_COMM for 2V. And it seems that the function init is read through but does not do anything, that is, it doesn’t matter if I initiate any channel at all to go to the loop. Also, just for curiosity, the function “spiTransfer()” is not defined in the library, and it seems the standard usage is to include the SPI library and then call SPI.transfer(). sorry, the “include” line above I have is incomplete, should be “#include ” as in your example. I am using yor library, and thankyou for such a big job. My project is weighting system with pressure sensor. Which is very sensitive – it ranges 6 kg = 3mV on 5V supply. When I try to change GAIN to 128 – the answer is only 0. What can be a problem. I also try to change bipolar-unipolar mode on GAIN 1, but nothing changes. On GAIN 1 it works fine, but I need to mesure very low voltage. Please help. It’s a little hard to tell without further details. But did you get any readings on any other gain settings between 1 and 128? Do you have a by pass capacitor in place? 1 In any case – chip sometimes show normal result and sometimes give only zeros. I do nothing, just turn it on and off and chip sometime work and sometime not. Now I have only one idea – my chip is damaged. I heve two capactors 10 мкф and 0.1 мкф on supply voltage. My schema is the same as on figure 22 from datasheet. No, you can not change the CS pin (or MISO, MOSI pins) since these pins are designated pins for SPI use (implemented in hardware). You can find out more information on this at http://arduino.cc/en/Reference/SPI. I am not sure why you would see a negative voltage from the output if you are using a single supply like the way I connected in the diagram. In regarding to the load capacitors, since I used a ceramic oscillator instead of a crystal the two load capacitors are not needed. But if you are using a crystal, you should add the appropriate load capacitors. Hope it helps. Hello K.Wong! Thank you very much for your advice, I put the generator into the circuit and it worked! But at the ground the third channel, I see -2.5, and the same values ​​on channels 1 and 2 by applying 5 volts on channel 3, and again, I see 2.5 on all three channels. That is, changing the voltage on the three channel maps at 1 and 2. But with supply 5 volts at 1 and 2 channel, I see 0 volts at the output of all channels, and at ground 1 or 2 channels, I see -2.5 volts on all channels. That is, Channel 3 is working fine, measures the voltage as it should, but why is the value displayed on the 3 channels 1 and 2 …. A channel 1 and 2 do not work correctly. Because what could it be? Did you try calling AD770X::readADResult() immediately after calling AD770X::init()? In other words, try using init(channel) and readADResult as a pair and let me know if it works. If not I will have to take a look to see where the issue might be. Thanks. I did as you said, used to initialize the values ​​of reading. When I used the initialization with only one parameter (the port number, like this: ad7706.init (AD770X :: CHN_AIN1) ;) then the Arduino boot time I saw real value, but then they were repeated, ie, values ​​are not updated, and displayed only the first value. Then I began to pass all parameters in the initialization function (ad7706.init (AD770X :: CHN_AIN1, AD770X :: GAIN_128, AD770X :: UPDATE_RATE_100) ;), then it work again, but began to work the same way as I described last time. Let me take a look to see whether any portion of the code could be changed to make it a bit easier to use. It has been a while, but I didn’t remember running into this issue when I was using the chip. I will reply back when I get a chance to take a closer look. According to the datasheet, you will need some delays between the reads (ideally you should poll the DRDY bit in the communication register or poll the dedicated DRDY pin, for simplicity reason I didn’t use that in the code library. And if timing is not critical, simple delays works fine). Also, if your clock frequency is different (I used 2Mhz), you may need to use the tweak the parameters according to the datasheet. And also the chip expects a write to the communication register upon power up. The library code I provided only offers very basic functionalities (e.g. bi-polar, 50Hz update rate and x1 signal gain), the chip is capable of doing much more and you will need to read the datasheet to implement these additional functionalities if needed. I have updated the library to make it easier to use. You can find the change details in this post. 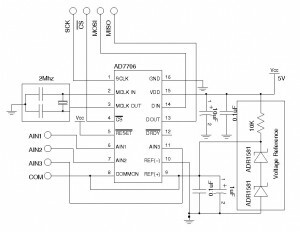 I’m pretty new to electronics but i have to use an adc to make a data logger. I might seem a little bit dummy but since i don’t have a big knowledge in electronics, can somebody say to me which kind of oscillator has used? in digikey.com i find tons of them, but i’m nor really sure on just grabbing one of 2MHz. any advice? Just wanted to say thanks for a great library. It’s been very helpful to get my project off the ground. I understand VRef and refOffset, but what’s the significance of dividing by 65536.0? I’ve translated the code into a .NET library for use on a Raspberry Pi 2 running Windows 10 IoT. is because the ADC is 16 bit (2^16 = 65536) so this line is to normalize the data and convert the measurement result to between 0 and VRef. i wanted to know if i can put negative voltage on ain1+ in ad7705 in bipolar mode and how, in bipolar mode i read at zero input 32768 that is maybe fine representing the middle point between -2.5 , 0 , +2.5 ok but dont want to fry the adc if putting negative voltages someone have been tried to read negative voltages? the datasheet is something confuse at this point. AD 7705 library is not supporting my Arduino UNO board. any suggestion…. please help me….. According to the circuit diagram, I made a module,Crystals choose 4.9152 M,22 pf the resonance capacitance,choose your AD770X1.1.tar program.but it doesn’t work!display 0.because DRDY pin has always been a high level(4.9V).what is the matter?? 1. Why do you prefer doing polling on dataReady rather then connecting the pin DRDY to some external interrupt pin and do stuff when the routine is called ? 2. Do you think it would be possible to include support for using the library in paralel with other SPI devices ? (i.e. a sd card reader or whatever).